The 26,000 sqm logistic bay has been created for fresh and very fresh products. 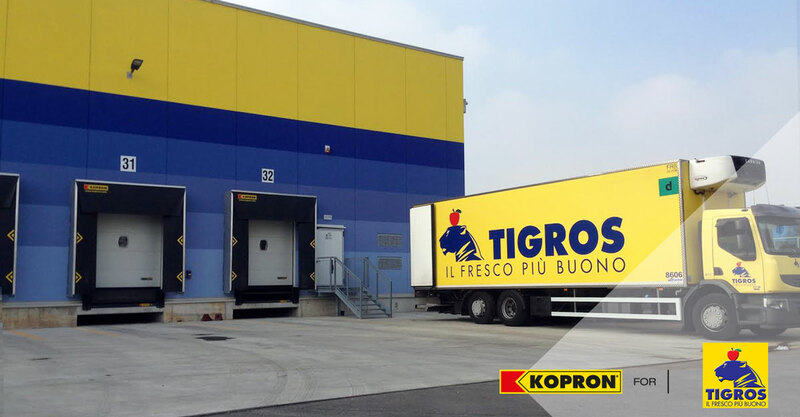 The very best Kopron products have been integrated into the new complex, handled by Engineering Techbau, to improve the logistical aspect of this important company from Varese operating in the field of large retailers. 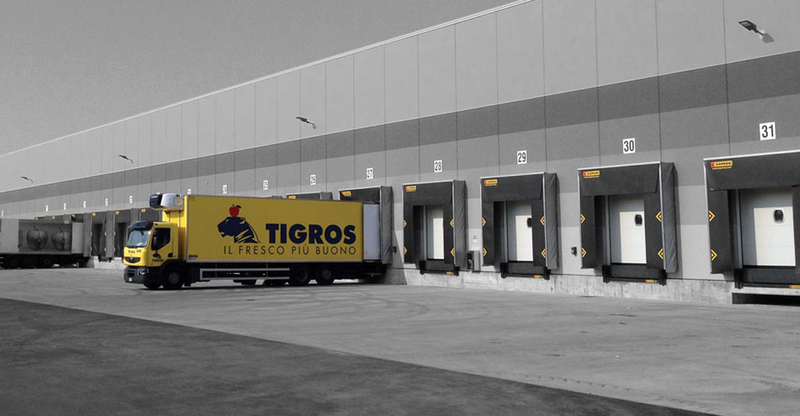 The new impressive logistic platform of fresh and very fresh products by Tigros (important chains of Italian Supermarket) has been created, a structure to serve the shops of the chain from Varese (North Italy). Kopron has contributed to the achievement of these objectives through its active collaboration with the customer, the important construction and engineering company Techbau, by installing made-to-measure dock levellers, dock-shelters with sectional doors, sliding doors and pedestrian doors in the new Tigros complex. “Fresh is better”© is the pay-off chosen by Tigros, a leading Italian company in the field of retail, to emphasise the best of its main objectives: offering fresh products, storing them in the best possible way in all phases of transport and to guarantee quality. Engineer Mario Buscaini from Techbau, states “This is a consistent and important logistic project for Tigros and thanks to this strategic choice close to its chains of supermarkets, they will be saving something like 1 million km’s normally covered by trucks in one year, together with benefits for the environment in a reduction of 1,300 tons of CO2 in the atmosphere”. 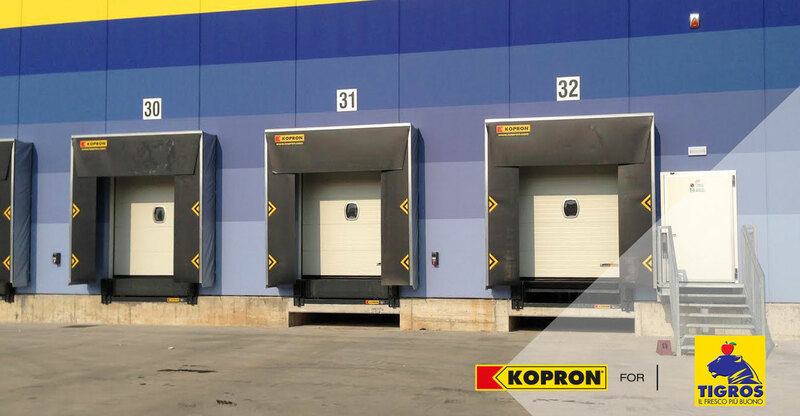 Kopron has dealt with designing and supplying all of the logistic equipment, it installed 42 loading bays including sectional doors, insulated frames, dock levellers with telescopic lip and with rotating lip in order to face the need to load large vehicles as well as small-medium sized vehicles. Furthermore, the building is also closed with industrial doors from the Kopron range: 6 sectional doors for vehicle traffic, 10 REI 120’ sliding fire doors, 39 pedestrian access doors including REI doors as well as multi-purpose doors. Every single product installed has the characteristics and features that Kopron is proud of, following years of dedicated work in this field. Paolo Calvi, Manager of the Division, clearly explains that: “The loading bays are elements that have been designed to simplify and accelerate the handling operations of goods, avoiding heat loss and generally consist of 3 parts built to work in synergy: the dock leveller, acting as a connection bridge for the transfer of goods from the warehouse to the vehicle and vice versa; the sectional door that acts as a heat closure, while the dock shelter external insulated frame covers and connects the rear part of the vehicle with the door of the warehouse as well as providing insulation during loading operations”. Tigros is a company that was born in 1979, the year in which Luigi Orrigoni, an entrepreneur from Varese, decided to start his activities in the field of foodstuffs by opening the first supermarket in Castronno. 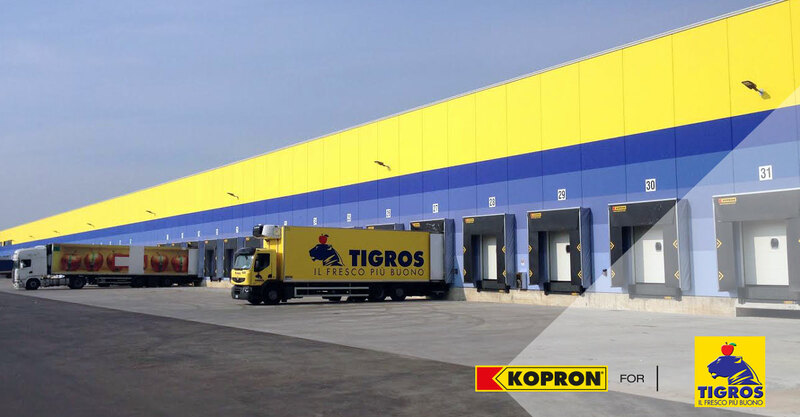 Tigros therefore chose the Best that Kopron had to offer, to offer the Best that its customers could ever ask for.